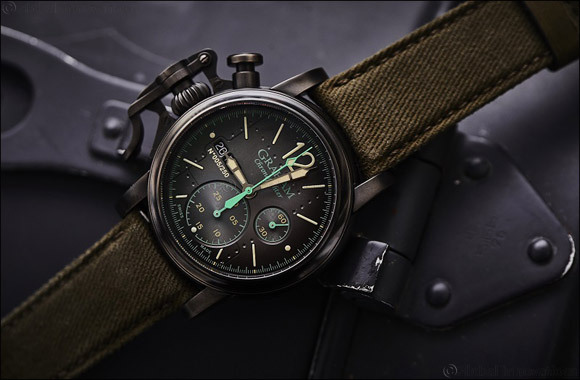 Dubai, UAE, March 27, 2018: Time to turn up the volume of the rock’ n’ roll attitude, shake the dust off the denim and bring out the maverick inside with the Graham Chronofighter Vintage Aircraft Ltd. Four different watches, each produced in a limited edition of 250, derive their distinctive identity from aged metal cases. The inspiration palette for the new watch spans from 1940s military aircraft to the gunmetal grey furniture at home in the hippest of Manhattan lofts. This message of edgy nostalgia, DNA of the entire Chronofighter Vintage series, is underlined by riveted dials with radial gradient. Ensuring the historic aviation inspiration remains on the radar screen, one reference has a picture of the British Royal Air Force’s Halifax aircraft stamped on the case back. The latest additions to the iconic Chronofighter family, with its signature stop-start trigger, are rebels with a very clear cause.